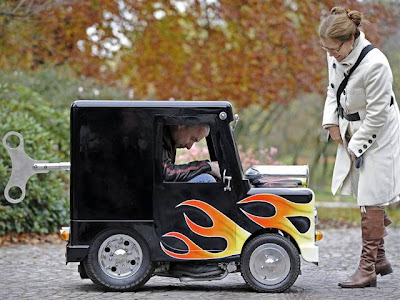 World's smallest car made by British inventor Perry Watkins, the “Wind Up” measures just 41 inches high, 51 inches long and 26 inches wide and is now listed in the Guinness Book of World Records with a license to drive on public streets. It can drive 37 miles per hour and even has seat belts. Watkins used a coin-operated children's ride, which he repainted, for the body and repurposed a chassis from a Shanghai Shenke quad bike. He used rear tires and wheels from a Honda Monkey motorcycle.The front wheels were custom-made to fit tires from a 1939 Brockhouse Corgi paratrooper’s mini motorcycle. Watkins has even affixed a revolving key to the back of the car to give it the appearance of a wind-up toy. Watkins is not new to building odd vehicles; he has also invented the “Flatmobile,” the world’s lowest car.